We currently use the Structure plugin from ALMWorks. When opening the pop-up to create multiple sub-tasks, it closes instantly. Thanks for reportig this issue! I'm sorry to say that I won't be able to fix this interdependent error with a third-party-plugin atm. Hi, we are experiencing the same problem, would you be able to look into this at this time? @Claudio Beretta Possibly the regular-expression used to extract the project-key fails when Structure is installed. Would it be possible for you to take a look at your browser's (not firefox) developer console (chrome: ctrl, shift + i) and look for a log output like "url extracted/project-key extracted"? @Claudio Beretta I could use a trial version of the Structure plugin to reproduce the problem. As I don't know this plugin - do I need anything to know to setup the environment? 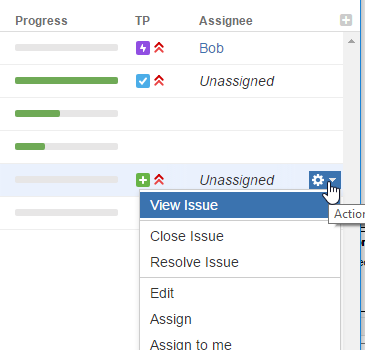 nothing special: just install the trial, create any structure, add any issue to the structure, click on the cog icon on the right and select "Create multiple subtasks"
@Claudio Beretta Ok, I'll give it a try. @Claudio Beretta Structure seems to be messing around with URLs, I have attached a patched version implementing a workaround, could you please confirm that it solves your problem?